Air compressors and small air compressors are technical machines used in industry but also at home. When shopping for a small air compressor, it can be a bit overwhelming as there are many different features and specifications available unless you are well versed, and up to scratch with your air compressor knowledge, you may feel a bit confused or lost. If this is the case, it is best to take things back to basics, ask yourself ‘what do I want this air compressor to do and why am I buying it?’ read online reviews and talk to the experts if necessary and you want clarification. View the Best Small Air Compressors, Below. What are Small Air Compressors used For? How do Small Air Compressors Work? What Type of Oil do you Put in a Small Air Compressor? Here is a list of ten of the best air compressors around that are storable, small enough to fit in a home workspace or garage and have enough power for your project needs. This is a small, quiet air compressor ideal for home garage workspaces and lower key projects. 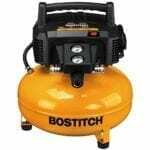 Considering this, the Bostitch BTFP02012 Oil-Free Compressor, still has a great power capacity, large PSI and large tank capacity as well. It is oil-free and needs a power supply. It also has two hoses for multi-tool usage and connection. This is quite a lightweight unit overall, very easy to carry and even easier to store if required. Yet its smaller nature does not detract from its overall efficiency. It also has the advantage of being maintenance free! This is one of the best small air compressors for air tools out there in the current market. It is very quiet (only 70 decibels when working), oil-free and corded and can accommodate a number of project sizes. This air compressor can be used in a variety of temperatures and on a variety of surfaces owing to its oil-free nature, so it is fully adaptable for a number of workplaces. Though it is corded, it is light enough to be portable if necessary and can fit nicely into any workspace. Excell U256PPE Pancake compressor is portable and lighter, it is able to fit into a number of workspaces owing to its size, but its function is still powerful and multipurpose. It is well designed and well reviewed, showing a reliable product from a dependable brand. This tank is also oil-free and therefore maintenance free, which is quite appealing when it comes to small air compressors. With a 150 PSI, this Excell U256PPE pancake compressor is up there in terms of capacity and durability as well. This is one of the most noise efficient small air compressors available for purchase currently. It only measures at 56 decibels and is, therefore, a perfect addition to any workplace owing to its lack of noisy outgoings. It is also lightweight and runs an oil-free tank, with a well-reviewed control panel. It has quite a low capacity tank and is less powerful than other air compressors out there, but it is still worth considering perhaps for those smaller projects or people who only want to use one tool at a time. It is very portable and weighs only 29 pounds, which though still a significant weight is still compact and easy to pick up. This pancake air compressor from Dewalt is oil free and very quiet and slots right into most workplaces to function as a high powered noise free DIY assistant for your project needs. It has an average sized tank for a small air compressor and can run multiple tools at once if needed. It is lightweight and portable, weighing only 30lbs which is around average again for a pancake style compressor. However, it is corded so it will require a power supply which should be taken into consideration when deciding where the product will be based. The pancake compressor has a control panel that is easy to use and protected during usage (with a plastic cover) and can provide powerful air compression to power your tools. This air compressor is oil lubricated which means that you will have to consider buying the right oil to go with the product in order for it to be properly maintained and keep it working properly. It is also quite quiet for an oil lubricated appliance and is built for durability and power. The design has taken into consideration the protection of the pump and is built to accommodate this. The tank is in fact 5.2 gallons, a respectable size when it comes to small air compressors and can have multiple tools attached and powered by it at any given time. This is great if you are looking for something a bit more multipurpose. This is portable with a handle that can be folded down for storage purposes and is built to withstand heavy and loud work environments. This is a gas powered air compressor, with a one-gallon tank capacity that is also oil-free. It is quiet, not the quietest air compressor from the options available at the moment on the air compressor market but still ranges at 71 decibels, which is a good noise level for an air compressor in a quieter hobby workspace for example. There are some very positive online reviews available to watch (YouTube) or read (various sources) and should be considered before buying as all information can help you decide if it is the right air compressor for your needs. The portability and lightweight nature of this air compressor make it great for smaller jobs, for example, pumping up tires on a work van or car with a slow puncture. This is especially true of its smaller tank capacity. This small air compressor made by Rolair is quiet and highly portable owing to its lightweight – 42 lbs and compact design (cylinder base). It has a sophisticated control system that is easy to use and easy to get your head around. The tank is oil-free, and therefore this small air compressor really doesn't require much maintenance at all, which is great for people who use it on a regular basis. The small air compressor only reaches around 60 decibels and therefore will not cause much disturbance to the surroundings when in use. It has a small tank and is for smaller jobs but is still powerful and has good reviews all around. Senco have created another great small air compressor which is well reviewed and definitely well bought. The product is lightweight and cylinder shaped to optimize portability in and around the workplace or hobby station. It weighs in at around 9kg, which is incredibly light for the purpose it serves and only makes it that much more attractive to people wanting something truly portable. It is electrically powered and therefore requires an electric source nearby in order to work, something that should be taken into consideration when deciding how this product will fit in with the workspace it will inhabit. This small air compressor is often described as quiet and nondisruptive, in that it measures around 60-70 decibels on the noise scale and can fit into any workspace neatly. Though this is a cordless air compressor from Dewalt, it has been reviewed as being as powerful as some of the corded electrical alternatives available for purchase. The product is quite light, weighing around 20 lbs and can help with a number of jobs from nailing to sanding. This product has a 135 PSI rating and 2.5-gallon tank capacity, which is up there in terms of product features. It is a good option for someone who is looking for something lightweight that still packs a punch. So from above, you have probably noticed that there are a variety of types and features when it comes to air compressors. There are portable, cordless, pancake to name a few and it really is down to deciding what you need from the air compressor as to which is best suited for you. Considerations Ask yourself some of the following questions when choosing which air compressor product to buy. Where am I putting the air compressor? This will dictate the shape and size of the compressor and also the power source (gas or electric) of the air compressor. Why am I buying an air compressor? To answer this, consider what you will be using it for and therefore what the expected workload of the compressor will be. What PSI, CFM, and horsepower do I need? Is it a big job or a small job? Are you using this professionally or for a hobby? All of these things need to be taken into consideration and well reviewed before making any purchase. CFM is a technical term associated with small air compressors. What it means is ‘cubic feet per minute.’ In nontechnical terms, that translates to at what pace the unit can supply air to the tool/tire you are wanting it to supply air to. This is quite an important consideration. You want something that will do the job quickly especially if you are working to a strict time frame. You also need a compressor that can supply air at the pace you need to work; otherwise, it will be a frustrating and lengthy process. There are processors out there that can keep up to pace, but they are worth sourcing out from reviews and product specifications to match up to your specific requirements otherwise you may end up with a product that just is not a good fit for your work needs. Therefore the higher the CFM (cubic feet per minute), the more tools you can power at any given time. You need to know your tool requirements before committing to an air compressor purchase as they need to be a good fit for each other. As with any product, however, there are different benefits attached to different brands and makes of the same thing. This is worth reviewing and doing research on as your needs are more than likely different to the next persons and everyone wants something different out a product, even if the basic function and desire is quite similar! Some small air compressors need oil to function, and other models do not. It depends on how they are made and who made them. The oil serves as lubrication, to keep the parts moving smoothly with each other. Therefore small air compressors that require oil are obviously higher maintenance than those that do not and have additional running costs attached. It seems to be the case that the majority or at least a larger percentage of small air compressors available on the market at the moment use oil-free tanks. This is definitely looking like a favorable option in terms of levels of maintenance and portability. People use small air compressors for smaller jobs, and therefore don’t want a lot of extra effort attached to their purchase. Oil-free tanks certainly provide that option better than small air compressors with oil lubricated tanks. One of the big considerations for small air compressors is how noisy they will be and how much that bothers you. It might be very important to you that they are quiet as to not disrupt your workspace overly, or you may not care if they are just for quick jobs such as pumping up your tires. However, it is worth noting that some small air compressors operate very quietly (as low as 60 decibels) and some really do make a roar. So with that in mind, always check if this is something that will sway your decision either way. Remember that just because an air compressor is quiet, does not mean that it is less powerful and likewise just because an air compressor kicks out a lot of noise does not mean that it has a lot of power to back it up! It is important to know what small air compressors are actually used for and therefore find out if they are indeed the product you require. In reality, they have a number of different functions attached to them and can be used for various jobs in various circumstances. They are used generally, however, as a power source for tools in construction and DIY jobs. 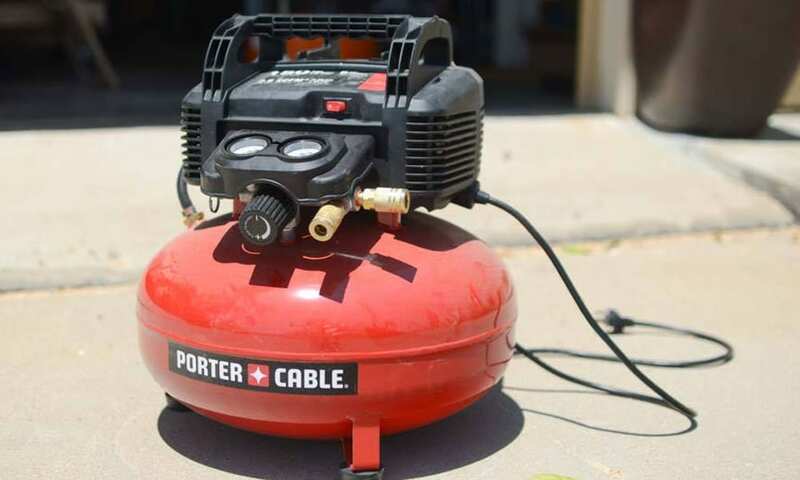 Lots of people do use the small air compressors to exclusively pump up tires, and therefore it is important that the air compressor is portable and durable, as it will be stored in a car most likely at a varying range of temperatures and made to travel over varying levels and types of terrain. There are some really good options on the market for people wanting air compressors for this purpose; definitely worth checking out reviews if this is what you are looking for. Of course, what you want the small air compressor for will ultimately dictate which level of air compressor you buy. The more powerful ones are obviously better suited for someone who wishes to run multiple tools at any given time, though if this is not the case, it may be worth considering one that uses less power and functions more slowly. Either way, there are plenty of options for either. 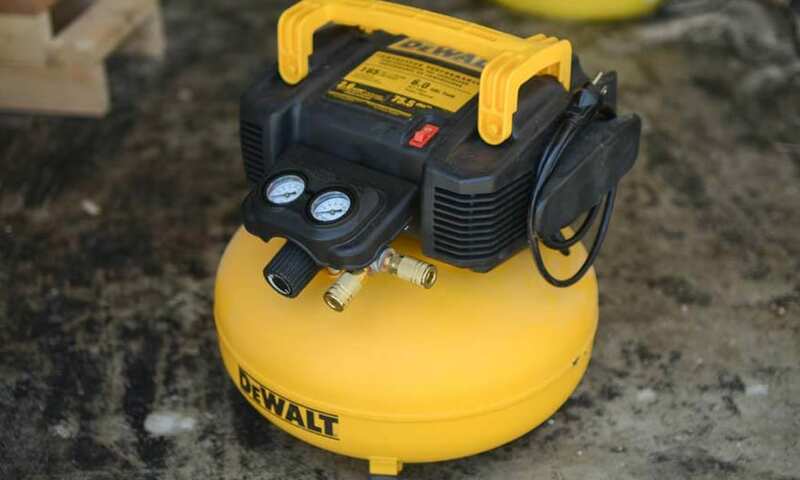 Small air compressors essentially push air from the tank in the unit, into the tools that you want to use for either DIY, hobbies or work purposes. They can be gas powered or electrically powered, and that is down to personal preference as to where you are going to be using your air compressor. Gas powered air compressors are generally heavier, but more durable and have a bit more power attached to them. Electrical air compressors are generally more portable and more suited to smaller workspaces. The majority of air compressors have motors that regulate the tank usage and capacity, i.e., when the tank is full of pressurized air, the motor will switch off and reboot when necessary as to not cause complications to the work process. Air compressors use a variety of different oils, however, in general, a specific oil for air compressors should be bought and used otherwise the product will not work properly, and the maintenance required will be of a much higher rate than otherwise. It does not matter if it is standard or synthetic, that is down to personal choice. Always read the instructions and recommendations from the company that will come with the small air compressor. This is the best and smartest way to decide which oil to use and will provide the best results. If you don’t follow the recommendations set out by the manufacturer and experience a malfunction in the air compressor because of this, the warranty will more than likely be null and void and you will be stuck with a broken product. The air compressor has a rich history with a long origin story. It has seen many primitive models and designs that ultimately led to the advance model we have available for us today, but early designs started way back in the 1700s with the same basic principles and ideas behind them. It is definitely worth studying the CFM of the air compressor; if you get this wrong, then you will get the whole product wrong and ultimately waste your money and time on something that is a bad fit for your project needs. With the right CFM, the air compressor can last a long time and go a long way, so make sure you have done your research! We hope you enjoyed our article on "10 Best Small Air Compressors in 2019", if so, please share and rate it.